At Wayfinder, we’re constantly blown away from the creativity displayed by our members. Co-op member, and badass cinematographer, Josh Berendes is no exception. In his latest project, Behind The Art, Josh recently drove up to Kenosha Pass with Jason Becker (of Trail Threads) to capture Jason’s story as an artist. Josh graduated with degrees in marketing, interactive digital communications, and digital media from the University of Northern Iowa. He works full time as a freelance video producer in Denver, CO creating content that ranges from social media videos, branded content, concert and festival recaps, as well as short films. Focusing on emotional appeals, Josh uses storytelling as a way to have longevity in a world where videos can be forgotten as quickly as they were consumed. His favorite pieces of work are ones that create inspiration, wonder, and gives him insight on a topic, organization, or person that he wouldn’t have had if he didn’t have a camera. He has worked with companies such as Snapple, ESPN 3, Florence University of the Arts, Bus2Alps, Visit Aurora and has been recognized by the American Advertising Federation for his work. We highly recommend Berendes Media for your next project. Reach out to Josh today! Outdoor Retailer is right around the corner and naturally we’re stoked! Wayfinder has some awesome events in the lineup for OR this January. After a very solid showing last summer, Forlulu Events is bringing back the event just in time to meet all your winter gear desires. Save your pennies now because we guarantee you’ll buy something awesome here. Come out and celebrate emerging brands in the outdoor, travel, adventure, and lifestyle industries. Demo gear, indulge in beer, and let your inner outdoor nerd enjoy. For companies - don’t miss out on the chance to jumpstart your brand! 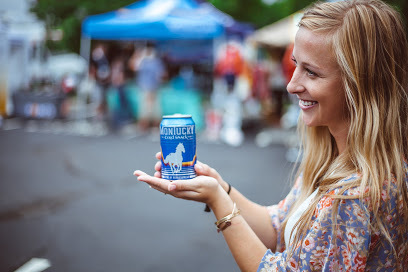 Last years Gear & Beer brought over 70 brands, a crowd of 800 individuals, and 17 kegs of beer. Starting rates for a spot start at only $150. Reach out to Forlulu Events for more info. It’s back and we can’t be more excited for another showing of outdoor-inspired product based companies. Pitching to a panelists of investors, fellow entrepreneurs, and advisors, The Pitch (presented by GearJunkie) brings innovative ideas right in front of the OR community. Finalists get invaluable direct feedback from experts, exposure to a captivating OR audience, and the chance to win some freakin awesome prizes. Specifically - two months free membership right here at Wayfinder Co-op and over $10,000 of free services (marketing, PR, legal, and consulting services). For more details on The Pitch reach out here. This week we’re speaking out to the startup entrepreneur, the full-time freelancer, and the remote employees out there. We understand the convenience and cost savings that come with working at home. Heck, who doesn’t love working in their sweatpants all day long?! You might even break up your week at your neighborhood coffee shop for the occasional outing. However, we also understand sometimes your just want to have a social community to connect with. Wayfinder Co-op is now offering you the chance to come in for a free week trial. Our community provides a space of outdoor and adventure enthusiasts, entrepreneurs, and companies that will immediately welcome you. At Wayfinder you’ll find a group of individuals who love making connections, curating collaborations, and sharing a good conversation over beers. If this sounds like something you immediately need to be a part of head on in! No gimmicks on our end - you’ll find us at 525 Santa Fe Dr. , Denver, CO 80204.